We live and breathe earth friendly shipping every day. And we love it! But we understand that for an e-commerce business, it’s not necessarily first on the list of things to research. But your shipping decisions affect first impression with the customer, your brand and customer loyalty, the environment, breakage and returns rate, and of course, your cost. So, we want to help make it easy! Here, we break down what you need to know about shipping boxes – when to use them, when not to use them, what strength and size you need, what the heck is flute, how much does it cost and how you can consider mother nature throughout your decision process. Please contact us if we can help you find the right shipping solutions for your business. Check out our other shipping guides: The Definitive Guide to Poly Mailers and Finding the Right Shipping Solutions for Your Business. Check out our other shipping guides: The Definitive Guide to Poly Mailers and Finding the Right Shipping Solutions for Your Business. Ready to order your boxes? Check out EcoEnclose's custom shipping boxes (all boxes are custom cut to your specifications and can be branded)! When should I use a box for shipping? What does Box Strength mean? When do I need lining, bubble or fill with my box? Should I consider custom inserts instead? What size box do I need? How do I measure a box? What kind of tape should I use? Should I use Pressure Sensitive Tape or Water Activated Tape? Are boxes eco friendly? Is paper more sustainable than plastic? The pros of shipping in a box: Boxes do a great job protecting your products. They make for great presentation. They come in virtually infinite size options so you can likely find one to meet your needs! Once they are filled, they are stackable, which can be great for your warehouse operations. They are made with paper, a renewable resource, and can be made with recycled content and up to 100% recycled content. They are recyclable and compostable. And most recipients have quick and easy access to recycling for paper.The cons of shipping in a box: They are not 100% weather proof, although we have found it rare that weather becomes a major factor in e-commerce shipping. They are typically more expensive to purchase than mailers. They are heavier than mailers, which can lead to higher shipping costs on both inbound boxes (shipped to fulfillment location) and outbound boxes (shipped to customer). They take up more space in your warehouse. They have to be assembled and taped which means boxes require more labor as compared to a mailer.For some products and businesses, the pros outweigh the cons, and shipping boxes win out. For others, mailers end up being the way to go. Here are the types of products and companies we most often find are best suited to use a shipping box. Large and/or bulky items: Boots, water bottles, blenders, children’s toys…these types of items that are wide, tall and relatively deep often need a box rather than a mailer. Collections of items: If you’re shipping a few different items in an order – say several lotions and hair care, or two bottles of oil and three bars of soap, or a pair shoes and a hat – a box tends to be more flexible and work better than a mailer. This is especially true if orders for your company vary but you only want to keep one or two different shipping containers on hand. You can stock a single box size that can work for almost all orders you anticipate. Items that must be handled with care: This includes fragile items such as a large glass bottle. Small, compact bottles can often be wrapped and shipped in padded mailers or bubble mailers. However, for larger glass bottles, a box is the way to go. This also includes something like a heavy, high quality, hard cover book or a picture frame. These items could work in a mailer. However, you may find that a box protects the corners more than a mailer does. Companies that are committed to high end presentation and branding: While mailers can be beautifully branded, a shipping box typically provides a more impressive un-packaging experience for customers. Boxes are sturdy, can be filled with presentation paper, and allow for items to be arranged in an appealing way. For this reason, some companies selling products that could be sold in a mailer (such as apparel) will still opt for a box. 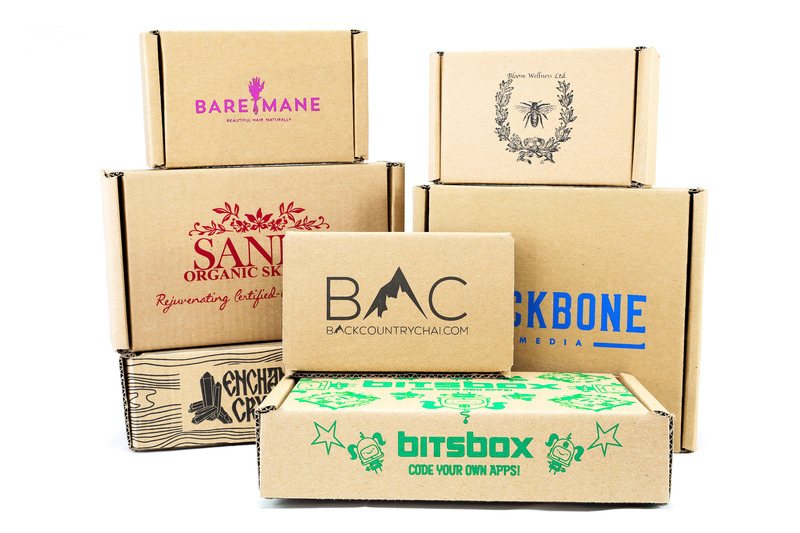 Subscription services: Subscription services or “box of the month” companies typically go with boxes for many of the reasons already listed above. Most importantly, the majority of them deliver a collection of items each month. Additionally, successful subscription services understand the importance of creating an appealing box opening experience that keeps their customer coming back again and again. Tab locking box (TL): These are the boxes we recommend the most and sell the most. This is the classic presentation style box that used by many brand conscious e-commerce businesses. These boxes create a wonderful opening experience for the customer. The logo/branding looks great on the lid of the box. The locking tabs create a clean seal for the box and gets the sealing tape on the bottom corner of the box (as compared to the top edge of an LM or the across the top of an RSC). These are ideal for most e-commerce products including apparel, accessories, cosmetics, small toys, outdoor wear. Avoid the TL when shipping large boxes (greater 15” x 15”) or heavy goods (>15lbs). Literature mailer (LM): Very similar in design to the TL box described above, this can be used for the same basic items. Because the material footprint is essentially the same, we offer the same price for the LMs and the TLs. Thus, for most customers, the choice between a TL and LM is based on aesthetic preference. The LM has the seam on the top edge of the box (vs the bottom edge of the TL). The LM’s lid rests on the sides of the box which hides the side seams and folds that see on a TL. However, it should be noted that the LM is quicker to assemble due to the lid folding into the box (vs the TL’s two tabs that are folded into slots). Regular slotted container (RSC): Regular slotted containers are the traditional industrial box that you have seen throughout your life. Think moving boxes and Amazon boxes. Each side has a tab that folds over and the seam is taped shut on the top and bottom of the box. RSC boxes are great for heavy products (>15lbs) and deep boxes (>6”). Many customers use RSC when packing wrapping fragile items in packaging paper or packing heavy items such as books, liquids, ceramics. Five panel folder (FPF): Very similar in design to the RSC, except FPFs have an extra inside flap that reinforces the structural integrity of the box. This design is best for tall or long items such as a wooden sculpted Stature of Liberty, a model of a skyscraper or a baseball bat. One Panel Fold (OPF): In a class all by itself, the OPF is a great box for slim to flat items such as picture frames, prints, books and jump ropes. The OPF flaps each fold around the product and meet on the back side of the box, creating a very clean front panel with no seams. The OPF can really look great when printed. There are several variations that can make these boxes very quick to pack. For example, we have developed a wrap-around OPF that allows you to literally “wrap” the product vs folding over each of the four sides. For the right product, the OPF is a great way to quickly package large volumes. If you go to our corrugated box page you’ll notice that we also offer trays, sleeves, pads and slotted dividers.Corrugated Pads typically serve one of three purposes. Product divider: Imagine two similarly sized wooden jewelry boxes are sitting side by side in your shipping box. You are concerned they will knock against each other, chipping paint or damaging the wood. Place a corrugated pad between the jewelry boxes to keep them from bouncing into each other during transit. Additional compression protection to your product. For example, semi-fragile bottle of lotion or oil could benefit from an additional layer of compression protection. By adding a pad to the top and/or bottom of the packaging, you have more cushioning upon impact. Increase rigidity of a print: Used frequently by artists when shipping with mailers, a corrugated pad can add additional rigidity to your print to reduce the chance of it being bent during transit. Scored pad dividers can separate two or more products within your box and provide more visibility, attention and protection to each individual piece. Imagine shipping a t-shirt and a rolled print in a single box. Without a divider, the t-shirt is going to flop around and likely damage the print. With a divider, the t-shirt can arrive looking sharp - still folded with the print showing immediately. The print – contained in its own cozy corner - arrives with no damage from the t-shirt. You can also find custom designed inserts. These inserts - made of cardboard and able to be cut to any shape or size - can hold your products in place during transit. Some common uses for inserts are to hold smaller cartons in place, to keep semi-fragile items from rattling around in the box or to simply create a better presentation upon opening. A corrugated sheet has two parts, the linerboard (the flat, outer covering) and the “flute” (the s-shaped, wavy paper between linerboard). The flute is what enables corrugated sheets to resist bending and allows the sheets and the boxes they are made from, to withstand pressure. B Flute 1/8” thick, 42-50 flutes per foot Resisting crushing, stacking strength. Good for folding and printing, and therefore, good for presentation style boxes such as Tab Locking and Literature Mailers. Lower price vs C or E flute. C Flute 11/64″ thick, 39-43 flutes per foot Provides good cushioning and strong enough for medium weight boxes. An effective surface for printing (though slightly less so than B flute). E Flute 1/16” thick, 94 flutes per foot Strong crush resistance. Excellent surface for printing. Excellent for folding. Becoming more popular in ecommerce presentation boxes. Reduces box storage space. The above chart describes “single wall” boards. Corrugated sheets can also be double wall or even triple wall for added thickness and strength. Double and triple wall corrugated flutes are described by the flutes of the two or three sheets used together. Multi-wall corrugated is typically only used in larger industrial containers and rarely used in traditional e-commerce. The vast majority of e-commerce shipping boxes are made with single wall flutes, and are typically B, C or E flutes, all of which strike an appropriate balance of creating strong boxes that are relatively lightweight. The strength of a specific box is driven by a number of factors – the box style, its dimensions, and strength rating of the corrugated sheets used to make it. This strength rating is driven by a number of different factors - flutes, weight, thickness of linerboard, and material used for linerboard, adhesive used to glue flutes to linerboard. 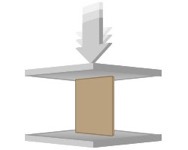 ECT (or Edge Crush Test) is the most common way to describe corrugated strength today. ECT tells you how much weight a sheet of corrugated can withstand when it is standing up (on its edge). For example, a 32ECT corrugated sheet, the most common type, means the sheet can withstand 32 pounds of pressure stacked on the edge of the board. The Mullen Test is how cardboard strength was measured for the majority of the last century. Also referred to as the “burst test,” this measures how much pressure a corrugated sheet can withstand when laying flat, suspended in the air. The Mullen Test is measured in PSI and the most common strength is 200lbs/sq inch. The fundamental difference between the two tests is that under the Mullen Test there is a minimum weight requirement for the liner of corrugated. That is, the Mullen Test requires that the base papers used to make corrugated linerboard weigh at least a certain minimum number of pounds per given unit of area. The ECT has eliminated this requirement, allowing the use of fewer and lighter weight materials while still providing high performance. So, when you are comparing two identically sized cartons with similar strengths, one being Mullen Test rated and one being ECT rated, the ECT rated carton will weigh less and use less materials. ECT strength is suitable for the vast majority of shipping boxes and is the only one that works with boxes that are made with recycled content. EcoEnclose box strengths are all ECT, and most companies who sell shipping boxes are in the same boat.As you’re trying to determine the best type of corrugated to use for your boxes, check out this great reference from the team of folks that have delivered millions…and millions and millions of packages just like yours – UPS. Even more important than their vast experience is that they are often the folks who will determine whether or not to honor claims on damaged packages! They provide the following recommendations on their websiteUPS does not address the 23B material, but based on our own experience, we have added our guidelines to the chart below. *EcoEnclose recommendations; not provided by UPS. As described above, ECT (or Mullen Test) is just one factor driving the strength of a box itself. The box style is also important. Regular Slotted Container (RSC) styles are inherently stronger; while Tab Locking styles are typically not as strong. Finally, the bigger the box, the lower its strength. That is to say, a box that is 5x5x5 made with 32ECT C will resist crushing more effectively than the same style box that is 10x10x10 made with 32ECT C.
Which corrugated material should I use? Protecting your product and ensuring your package can withstand the weight of its contents during transit. If you are shipping small, light items that aren’t fragile, you likely don’t need the heavy duty box. Look closely at the table above regarding the recommended product weight and box dimensions for safe transit. Printing. Some corrugated sheets – especially 32ECT E – are thinner, sleeker and/or result in more successful printing because the flutes are narrow and tight together. Contrast this with the 44 ECT with less flutes that are twice as wide; these flutes create small ridges in the printing surface. You will feel these ridges as you run your hand across the cardboard and they make it difficult to get an even print finish. Cost efficiency. Consider the cost of the box itself, the inbound shipping (to your fulfillment location) and outbound shipping (to your customer). 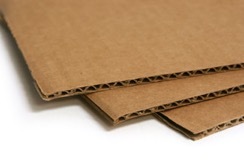 A given board material is typically stronger because it has more cardboard material per square inch. For two identical boxes designs, the stronger material will cost more and weight more. EcoEnclose offers four different corrugated sheet options: 23ECT B Flute, 32ECT C Flute, 32ECT E Flute, and 44ECT C Flute. We work with these four specific options because we have found these a) satisfy nearly all non-industrial shipping needs and b) are most cost effective options to meet said needs. As you consider your options, here is a handy chart to determine the best sheet type for your box. 23ECT B Flute Literature Mailer Tab Locking Box One Panel Folder Tray Sleeve You are shipping items that collectively weigh less than 10lbs, want minimize costs and/or want a basic print on the outside of the box. You are shipping heavy things (>10lbs), have a large box (greater than 32 inches of L + W + H), want to print on the inside of the box. 32ECT C Flute Large Presentation Boxes (LM or TL) Regular Slotted Container (RSC) Five Panel Folder (FPF) One Panel Folder Tray Sleeve You are shipping items that collectively weigh between 10lbs and 30 lbs; or have a larger Presentation Box with greater than 30 inches in L+W+H). You are shipping very light materials or small material as you are likely overpaying for the extra protection. B flute can be 15-20% cheaper that C Flute. 32ECT E Flute Literature Mailer Tab Locking Box You are want a very clean design, an excellent printing finish or to print on the inside of the box. This also a good option if you have limited storage space because the material is much thinner than either B flute or C flute. You are shipping very light materials or small material as you are likely overpaying for the extra protection. The raw material for 23 ECT can cost 15-20% less than that 32 ECT. 44 ECT C Flute Regular Slotted Container (RSC) Five Panel Folder (FPF) When you your shipping items collectively weight over 30lbs or you have a high value product that needs the heavy duty crush protection. You are shipping very light materials or small material as you are likely overpaying for the extra protection. Raw material on 44 ECT can cost 40-50% more than the 32 ECT. We can offer most designs in any material if you have a specific need. We try to limit the stock options to simplify the decision process. If your item or items fit snuggly without moving around in your box AND if your items is not fragile, you likely do not need void fill, though you might consider void fill or tissue paper for presentation. EcoEnclose custom cuts every single box according to customer specifications, allowing you to get the exact right box for your needs. Our hope is that allows you to eliminate or at least minimize void fill and ensures you aren’t using and paying for more corrugated than you need. There are two reasons you might need some sort of fill or lining. The first is for void fill, when the shipper box is larger than the product or products it contains. This is the most common reason our customers look for lining or fill in their box. The second reason is for bracing or blocking. This is for instances when the product being boxes is heavy, possibly fragile and/or of high value. For these packages, you need to completely immobilize the product within the shipper box – likely requiring. Corrugated bubble: Typically used for void fill, these are sheets of shredded corrugated, these can wrap around items and be rolled up and used to fill in empty spaces in boxes. If you are consistently packaging the same product, these can be cut to a specific size, eliminating the need to tear paper or cut bubble wrap. GreenWrap: This is a wonderful product that can be molded around items to provide cushioning and padded protection. Imagine bubble wrap, but in paper instead of plastic. And being paper-based, it is naturally biodegradable, compostable and fully recyclable. The GreenWrap we sell is also SFI-certified – Bonus! Peanuts: Loose fill peanuts are those “S” shaped pieces made with expanded polystyrene (what you get when you inject plastic with air) that can be dumped into a box to fill in all of the excess air. They are easy for shippers to use, and offer good product protection. However, they are often annoying for recipients as are difficult to clean up, and often cling to things and people. They come with environmental downsides as well. Recycled content options are available (though not with any post consumer waste); however, they are difficult to recycle and they are very costly and unsustainable to ship – unlike many other void fill options that are stored in “compact form”. This also means they require lots of room to store. Bubble wrap: Here’s a little bit of a fun fact - Alfred Fielding and Marc Chavannes invented bubble wrap when they found a way to seal pockets of air in between two plastic shower curtains to create a three-dimensional pattern of tiny bubbles that they had hoped would become a new wallpaper! Bubble wrap has a lot of benefits for fragile items – its moldable, offers great protection, and let’s face it – is super fun to stomp on and pop when you’re done. It is functionally a good solution for blocking and bracing. Downsides? Thus far, it is not available with much - if any - recycled content. Recycled options do exist but they typically have less than 20% of post industrial waste only. It is also very difficult to recycle. And finally, like peanuts, it cannot be stored in compacted form so it is expensive to get it delivered to you and takes a lot of room to store. Inflatables: These small plastic pillows of air are becoming more common and can be used for void fill or blocking and bracing. They have their advantages. You can fill in spaces in boxes quickly and easily, with fairly minimal material. They are stored uninflated and flat. They are also becoming available with some amount of post-industrial recycled content and can be found recyclable and biodegradable. The main disadvantage is that they only make sense if you have an expensive “air filler” machine and once you buy that machine, you are committed to a single supplier for your inputs. Additionally, they don’t make for the best presentation and lead companies to become lax about their box size and empty space – which leads to more expensive, less eco friendly shipping and customers who become frustrated with what appear to be wasteful practices. Crinkle paper: Crinkle paper is great for void fill in smaller packages and situations where presentation is important. It ships and stores in compacted form, and then nicely expands for your packages. It does a solid job protecting fragile products. And it is available with recycled content, and is easily recyclable. However, crinkle paper tends to be expensive – its base cost, and the cost of shipping the product to your warehouse – so it can be cost prohibitive for some. Tissue paper: Tissue paper is not great for void fill or blocking and bracing; however, it is makes for beautiful presentation. It can be a strong addition if your shipper box fits your products snugly, but you want to add one layer of presentation for the recipient. What are custom inserts? They are corrugated sheets custom cut to separate or hold your products within your box. Here are some examples. See the unboxing experience as key to their brand and overall customer experience. If you are interested in working with EcoEnclose on custom inserts, contact us at design@ecoenclose.com. At EcoEnclose, every single box we sell is custom cut, so it is the exact size you need it to be! With our boxes, you can minimize all of the extra, unnecessary air within a box – for more eco-friendly shipping that is less expensive and more visually appealing. If you are trying to figure out the right size for your EcoEnclose boxes, we typically recommend laying the item(s) you need to ship on a table and measuring an “imaginary boundary” around it to get the length, width and height. If your vision is to make the box fit perfectly around your items, then a simple guideline would be to add 0.125" to the Length and 0.125” to the Width (and keep the height the same). If you are going to use void fill, then consider what type and how much fill you plan on using, and add this “cushion” to your dimensions. Note that the dimensions you input on our site for boxes refers to the inside dimensions of the box you’ll receive. If you have any doubts, we recommend that you order a sample prior to stocking up. Most other shipping supplies companies provide stock sizes for each of their different box styles. If you ordering stock box sizes, we recommend going through the same steps as above, and then finding the stock box size (in the style you are seeking) in dimensions that are at least as big as what you measured. Remember that minimizing your box size is ideal for a number of reasons – it reduces void fill you might need, it is greener because less material is used and less extra air is shipped, and (especially in the age of dimensional weight pricing) can lead to cheaper shipping costs. There are two main categories of carton sealing tape - water-activated tape (WAT), also known as gummed tape, is a form of paper tape with a water-based chemical adhesive that is reactivated by water. Water-activated tape can be found in plain Kraft paper or with several layers of paper and fiberglass reinforcement. When the water-activated adhesive is applied to a carton, a capillary action bonds the tape to the carton. Pressure-sensitive tape (PST) consists of film and a tacky substance that adheres to a given surface when light pressure is applied. Most tapes you use at home - masking tape, duct tape, Scotch tape – are all PST. A note on sustainability: The vast majority of packing tape is made with virgin materials. Options (like ours) do exist that are made with recycled or renewable (plant-based) materials. Additionally, options (like ours) are technically biodegradable and/or recyclable. However, when you’re looking for the most sustainable tape option, it is important to understand the disposal process for the material. The majority of boxes in the US are recycled (rather than composted). The process of recycling corrugated boxes involves churning it up with water to make a slurry. In this process, adhesive and any polymers rise to the top and are skimmed off and disposed of. For this reason, the majority of materials in packing tape are likely to end up in a landfill, even if they are technically recyclable or biodegradable. Therefore, we recommend focusing predominantly on how tape is made when choosing the most sustainable option. Can I custom print my boxes? Yes! Branding your boxes can be a great way to promote your brand and wow your customers. Boxes can be printed through a few methods: flexography, screen printing, and digital printing. As you can imagine, they have their pros and cons. Digital printing allows for an immense array of colors and designs for corrugated. Finish can be matte or gloss. And the set up time is low. However, the cost per print or box is very high. Digital corrugated printing is therefore not typically used for shipper boxes and is reserved for things like displays and retail packaging. Flexographic printing turns your design into a “plate” which is then used to stamp your boxes with fast drying ink. There is a setup fee and time associated with it, but then the per-box printing fee is fairly low. EcoEnclose uses flexographic printing and has helped companies design beautiful shippers! As an added bonus, flexo printing (unlike digital printing) easily allows for the use of soy and water based inks which can be non-toxic and can be safely recycled or composted. Screen printing is a process by which ink is forced onto a surface through a prepared screen of fine material to create the desired design. It is known to create vibrant colors because the ink is applied thickly. This process is most frequently used for apparel, but is certainly an option for cardboard for individuals or shops that are already screen printing as part of their business. EcoEnclose uses flexographic printing and offers single color custom printing on virtually any box size and style. While our primary service is to offer single panel printing, we also offer multi-panel printing options and can print on the inside of boxes made with our 32ECT E (E flute) option. Grab a cup of fair trade coffee and stay awhile… this is one tough question! There are lots of things to consider when it comes to the full environmental life cycle of your shipping containers. What does it take to make them? Typically, a cardboard box requires more resources and takes more energy to produce than an equivalent plastic mailer. One 13x19x2” cardboard box requires 0.7 lbs of paper while 1 12.5x18.25x.25” poly mailer requires 0.052 lbs of plastic. However, cardboard is of course made from trees, which are a renewable resource. The same box takes 23 times more energy and emits 6 times more CO2 in production than the mailer. What does it take to ship them (to you, and then to your customers)? The carbon footprint of shipping is driven both by dimension and weight of packages. Here again, cardboard is typically heavier than an equivalent poly mailer (and inherently leads to more air being shipped) and therefore requires more energy to ship. What happens after you use them? Most boxes and mailers can be reused, at least once. However, most of them are not reused. Consumers are far more likely to recycle cardboard boxes than plastic mailers. Recent studies have shown that over 70% of cardboard boxes are recycled in the US and this figure is increasing each year. This is very important, as it means that despite the fact that poly mailers do have some eco advantages in manufacturing and logistics, the majority of them are still landfill bound. On the other hand, boxes are more likely to find themselves recycled and put back in the industrial supply chain. Additionally, boxes can be composted. Bottom line? There really isn’t a bottom line unfortunately. Paper has its advantages as does plastic mailers. Ultimately, we recommend that you make the best decision for your specific products and company. What protects and presents your goods as effectively as possible? If you have decided that boxes are the best solution for you, then the best thing you can do for the planet is to work hard to make all aspects of your shipper boxes sustainable. How do you do this? First, choose as much recycled content as possible. A lot of companies tout “made with recycled content” on their boxes. This is a fuzzy statement, that as a standard, typically means made with approximately 30% recycled content. If you can, look for boxes that are made with 100% recycled content and as much post-consumer waste as possible. Our boxes are 100% recycled, with at least 95% post-consumer waste. We say, “if you can” because it is important to acknowledge that paper products made with recycled content are weaker than their virgin content counterparts. Virgin paper fibers are longer, and longer fibers interweave better, leading to stronger paper. In some situations, such as boxes carrying heavy items that are palletized, or boxes carrying expensive and fragile items (think high end electronics), 100% recycled corrugated isn’t strong enough. But we have found that most products being shipped to customers work well in our 100% recycled boxes. We encourage you to order a sample or contact us if you have concerns about the quality and strength of recycled cardboard. Second, make your box as small and snug as possible for your needs. If you order stock sizes from a supplier, work hard to find the best right size for your needs. Better yet, order custom sizes so you know you’re not using any more material than you need – for the box itself and for void fill. Third, work hard to encourage your customers to reuse, recycle or compost their boxes! Let them know in your confirmation and/or shipping emails? Add a stamp or a note in their box encouraging them to dispose of their boxes responsibly. Or take a cue from some of our super creative companies and provide cool ideas for reuse (one company filled their box with seed paper and encouraged customers to plant a garden in the box itself!). Finally, choose eco-friendly shipping services. If you don’t need your boxes right away, choose ground shipping. Give your customers the option (and encourage them to take it!) for ground shipping.